The India–Pakistan Border, known locally as the International Border (IB), is an international border running between India and Pakistan that demarcates the Indian states and the Pakistani four provinces. The border runs from the Line of Control (LoC), which separates Indian-controlled Kashmir from Pakistani-controlled Kashmir, in the north, to the Zero Point between the Indian state of Gujarat and the Sindh province of Pakistan, in the south. Drafted and created based upon the Radcliffe line in 1947, the border, which divides Pakistan and India from each other, traverses a variety of terrains ranging from major urban areas to inhospitable deserts. Since the independence of India and Pakistan (see British India), the border has been a site of numerous conflicts and wars between each country, and is one of the most complex borders in the world. The border's total length is 3,323 km (2,065 mi), according to the figures given by the PBS; it is also one of the most dangerous borders in the world, based on an article written in the Foreign Policy in 2011. It can be seen from space at night due to the 150,000 flood lights installed by India on about 50 thousand poles. The border between the two Nations is an internationally recognised frontier from Gujarat/Sindh only with exemption to the Line of Control that is not internationally accepted. The Kashmir disputed region is divided by the 1949 UN ceasefire line, established after the Indo-Pakistani War of 1947, into two main parts and the de facto demarcation dividing Pakistan-administered Kashmir from Indian-administered Kashmir has been called the Line of Control since 1972. Between Pakistan and India lies the Pakistani territories of AJK & Gilgit-Baltistan and, also the Indian state of Jammu and Kashmir. On the other side where the internal borders of the Pakistan's Punjab provincial border, is officially called the Working Boundary by Pakistan (which is a recent term) and international border by the Government of India. Working boundary: The line between Punjab Province of Pakistan along Sialkot and Indian controlled Kashmir. It is called a working boundary because on one side is an internationally recognised land (Sialkot) while on the other is a disputed territory. 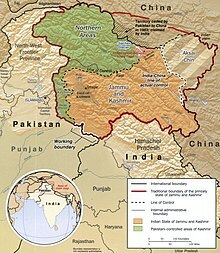 Line of Control (LOC): Line of control is the boundary between the Pakistani Azad Kashmir and Indian Jammu and Kashmir. It was demarcated after the Simla pact in 1972.
International boundary: The demarcated line between the Republic of India and the Islamic Republic of Pakistan recognised internationally. Sir Cyril Radcliffe Demarcated the land in 1947. Attari at Wagah, Punjab, India, is the most famous and prominent border crossing point between India and Pakistan due to Wagah-Attari border ceremony. The crossing is located 32 kilometres from Amritsar and 24 kilometres from Lahore. Munabao : This village situated at Barmer district in Rajasthan, is famous for the railway station through which, the Thar Express connecting India with Pakistan runs. The crossing point had been closed after the Indo-Pakistani War of 1965. In February 2006 it was reopened and since then the Thar Express operates from Bhagat Ki Kothi in Jodhpur, India to Karachi, Pakistan. Baba Chamliyal Mela" at Indo-Pak international Border, Ramgarh sector, 45 km from Jammu, where people from both the nations take part. Evening flag lowering ceremony at the Wagah border (as seen from Pakistani side of the border). 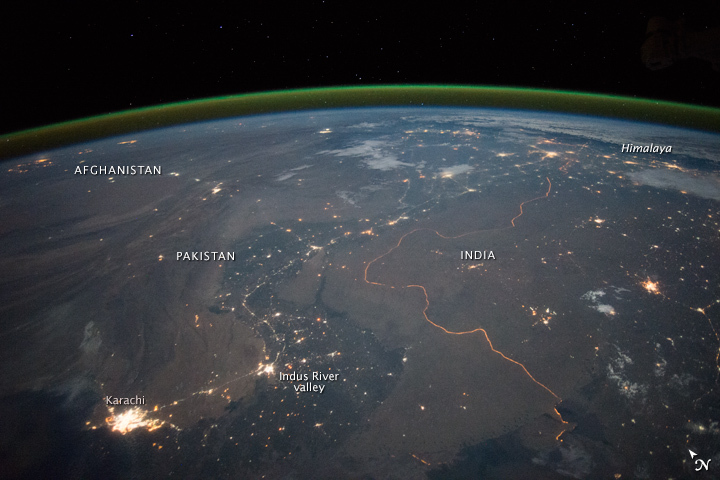 The floodlit border zone between India and Pakistan has a distinctly orange hue in this astronaut photograph. Trucks on National Highway 1 (India), waiting to cross Wagah border. Punjab Rangers at the Wagah border. ^ Khan, MH (5 March 2006). "Back on track". Dawn News archives. Retrieved 15 April 2013. ^ a b c PBS Release (July 26, 2005). "Border Jumpers The World's Most Complex Borders: Pakistan/India". PBS. Retrieved 15 April 2013. ^ PHILIP WALKER (June 24, 2011). "The World's Most Dangerous Borders". The Foreign Policy. Retrieved 15 April 2013. ^ "Dailymail". Retrieved 23 October 2014. ^ "India-Pakistan Borderlands at Night". India-Pakistan Border at Night. NASA. 23 September 2015. Retrieved 14 October 2015. ^ "Radcliffe Line to divide India-Pakistan was formed this day: Read about it here". India Today. 17 August 2016. Retrieved 30 July 2018.